This album has photos that have been taken at abandoned, closed or vandalized locations. Many are from the boarded up Sanitarium which closed 39 years ago. It was called Sunny Acres and was, first an Orphanage, then a TB Sanitarium, lastly a Detention Center, which some say is haunted by those that did not leave its walls. Today it is near collapse inside, a home to hundreds of pigeons and rodents and unsafe to walk around, especially upstairs, where most of the floor was destroyed by fire or has rotted away. 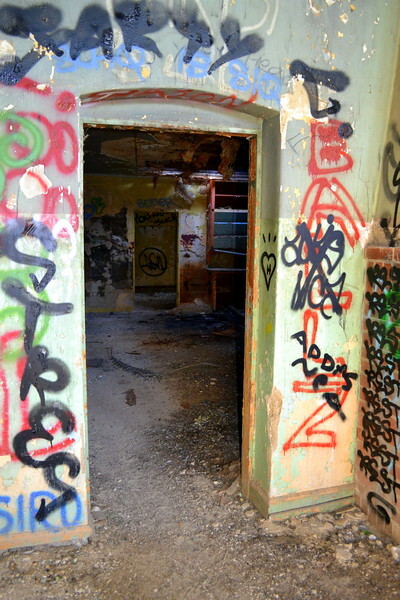 Outfitted with a respirator, hard hat, boots, flashlight and my camera, I took photos upstairs and downstairs of what remains of the cells, hallways and much of the graffiti that adorns the walls (some of the graffiti is graphic in nature). Other photographs are around other dark alleys, abandoned buildings and areas off the beaten track! You then have photographs from the old Camp San Luis World War II Barracks. Feel free to email me with any questions or if you have a location you think I would enjoy photographing! All photographs are available for purchase on gift items. To order Tiles, Magnets, Puzzles, Coasters, Playing Cards, Mugs, T-Shirts, Key Chains or Framed, Canvas and other Prints, Click Buy, "This Photo" and all the merchandise choices will be listed. If you're looking for something in particular that you can't find here or in our other galleries or if you are interested in Stock Photography and the use of an image, please email me at vivkrug@gmail.com and I'll see if I have your image in my files and just not yet listed.